Jiri lies at an altitude of 1,905 meters (6,250 feet), is the easternmost terminus of the highway coming from Kathmandu. Daily bus service is available from Kathmandu, but 184 km ride takes 6 to 8 hours due to narrow, winding roads and checkpoints along the Araniko highway. The seasonable road is driven to Bandara, Shivalaya or up now a day. Jiri route trekking is not busy because of many climbers or trekkers use fly to Lukla. 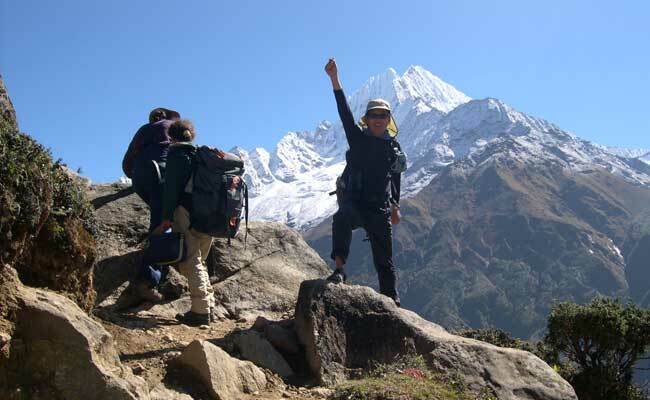 Trekking to entrances in Sagarmatha National park or Khumbu valley takes 6, 7 days. Mount Everest; to the Nepalese it is simply called Sagarmatha, the "sky head", the Tibetans call Chomolungma or Jomolungma, “The Mother Goddess of the Earth”. One of the major goals to do trekking in Everest, the “Sherpa” were nomadic people who first settled in the Solukhumbu District (Khumbu), Nepal then gradually moved westward along salt trade routes. 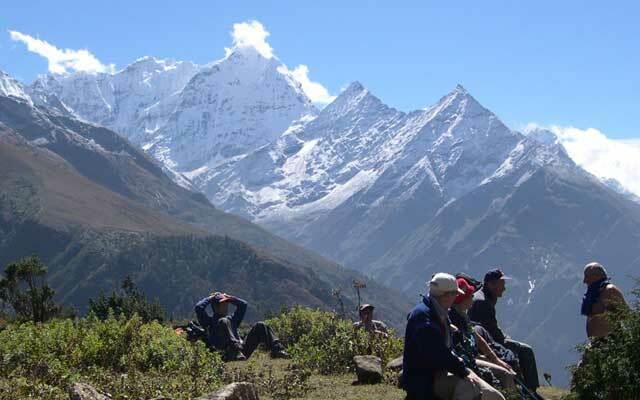 Their culture, history and their hospitality are interesting to visit trekking Everest area. We follow an ancient salt route trek that drives to Jiri upon seasonable road Bhandara, will take us through tiny villages, across high mountain passes, and through remote valleys, villages, and monasteries. The views grow even more spectacular as we venture up the Dudh Kosi River to Namche Bazaar, the gateway to the Khumbu area at 3440m (11,300 feet). We will spend an extra night in Namche bazaar, next to the Tengboche monastery 3868m (12,887 feet), where you will be rewarded with spectacular views of Ama Dablam, Nuptse, Mt. Everest and Lhotse. Continues trekking is in Pongboche village, Dingboche and entry to Everest Base Camp. A non-technical climb of Kalapattar 5545m (18,450 feet) highlights the truly spectacular panorama of Sagamartha (Mt. Everest), the Mother Goddess of the World 8848m (29,030 feet), Nuptse and Lhotse 8516m (27,560 feet). A day long walk to Everest Base Camp over moving rocks and glaciers spending few hours is recommended because of there is not protect tea house or social hut. During the expedition season there are lots of tents may you can find coffee bar, bakery and internet. Either you can return the same way or cross the high passes Chola or Renjola and meet the trail in Namche Bazar. Day 01: Arrive Kathmandu; transfer to Hotel, Overnight at hotel (B). Day 02: Final preparation for trekking and half day sightseeing in KTM, Overnight at hotel (BB). Day 03: Drive from Kathmandu to Jiri. 7-8 hours drives, overnight Guest house (B/L/D). Day 04: Continues drive by local bus to Shivalaya 2 hours and trek to Bhandar, 3 hours, overnight Guest house (B/L/D). Day 05: Trek to Sate village 5 hours, overnight Guest house (B/L/D). Day 06: Trek over Lamjura pass to Junbesi 8-9 hours, overnight Guest house (B/L/D). 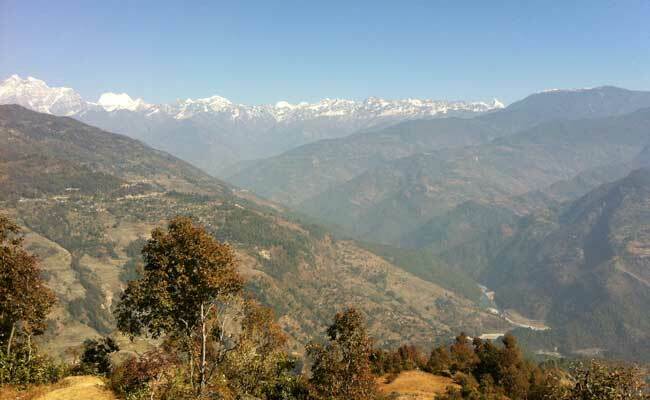 Day 07: Continue trek through Solu to Nunthala 6 hours, overnight Guest house (B/L/D). Day 08: Trek to village of Khare-Khola 5 hours, overnight Guest house (B/L/D). Day 09: Trek to Surkhe 5 hours, overnight Guest house (B/L/D). Day 10: Trek to Phakding 5.30 hours, overnight Guest house (B/L/D). Day 11: Phakding trek to Namche (3440m), 5.30 hours, overnight Guest house (B/L/D). Day 12: Namche Bazaar rest day for acclimatization (B/L/D). Day 13: Namche Bazaar trek to Tyangboche, (3860m), 5 hours (B/L/D). Day 14: Tyangboche trek to Dingboche, (4350m), 6 hours, overnight Guest house (B/L/D). Day 15: Dingboche – Acclimatization (B/L/D). Day 16: Dingboche trek to Lobuche (4925m), 6 hours, overnight Guest house (B/L/D). Day 17: Lobuche trek to Gorakshep (5170m) continues EBC (5370m)return to Gorakshep, 7/8 hours, overnight Guest house (B/L/D). Day 18: Gorakshep climb Kalapathar (5545m) and trek to Pongboche 6/7 hours, overnight Guest house (B/L/D). Day 19: Pongboche trek to Namche Bazaar 6 hours, overnight Guest house (B/L/D). Day 20: Namche Bazaar trek to Lukla 6 hours, overnight Guest house (B/L/D). Day 21: Lukla to Kathmandu by short flight, transfer to Hotel (BB). Day 22: Kathmandu – Own way journey or next trip (B). Sagarmatha National Park permits, fees. Trekking insurance, meals, accommodation for all support crews and their daily wages. Day 01: Arrive in Kathmandu, transfer to Hotel, overnight at Hotel (B). Arrive in international airport meet our staff transfers to Hotel, welcome dinner with group meeting, Overnight at hotel. Day 02: Preparation day for trekking and sightseeing tour (BB). City tour with city guide and tourist coach; Kathmandu is the colorful of Nepal, a fascinating blend of rational architecture and symbols of the twentieth century. It’s artistic and cultural heritages is evident where ornately carried balconies mingle with beautiful shrines and temples. If you have time, we recommend that you check out Durbar square, home to the palace of Kumari Devi, considered to be a living goddess. It is also worth the climb to visit Swaymbhunath the monkey temple. Explore the network of street Markets and ally Bazars and witness the burning Ghats at PashupatiNatha. For those with a few extra days in kathmandu, the neighboring towns of Patan and Bhaktapur are well worth a visit too. Day 03: Drive from Kathmandu to Jiri. 7-8 hours, overnight Guest house (B/L/D). Early morning drive by tourist coach takes 7- 8 hours interesting view on the way. We stop breakfast and lunch on the way. Overnight at Guest House. We drive to Shivalaya at 1800m by local bus. Before the Jiri road was opened the trek used to go through those, which at that time was the busiest market town between Lamosangu and Namche bazaar. After reaching Shivalaya, we make another climb to Sangbadanda at 2150m, Kosaribas at 2500m, then to Bhanjyang, a pass at Bhandar at 2200m. We can possibly take a detour between Sangbadanda and Bhandar to visit Thodung at 3090m. Overnight at Guest House. 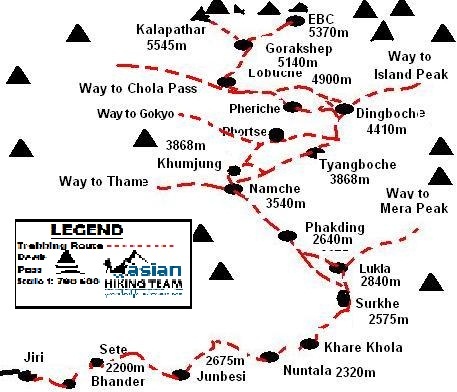 Today the trail drops down to the Likhu Khloa and crosses the river at 1580m, and tracks along it to Kenja. Now we make the long climb to Lamjura pass. The first part of the climb is quite steep, and then it traverses to Sete, and abandoned gompa at 2575m. Then we continue through the villages inhabited by Sherpas and have both Nepali and Sherpa names. Overnight at Guest House. The day begins with a long but gradual climb to the Lamjura pass at 3530m. There you are rewarded with frost and often snow along the trail in winter or with flowering rhododendrons in the spring. Goyem at 3300m. The pass is the highest point between Jiri and Namche Bazaar, there you have good lunch stop. From the top you descend to Tragdobuk at 2860m, then to the pretty Sherpa village of Junbesi at 2675m. Overnight at Guest House. This day we climb to a ridge at 3080m, from where Everest slowly begin to appear infront of your eye, then on to Salung at 2650m. From Junbesi the trail leads to the hospital and airstrip at Phaplu and the district headquarters and bazaar at Salleri. Leaving Salung, we make our way descending to the Ringmo Khola at 2650m. The trail ups to Ringmo. There we see garden of apples and other fruit; the Apple House offers apple juice, pie and rakshi (rice spirit). The new trail from here to Namche Bazaar was built in the 1980s and avoids many of the steep descents and ascents of the old route. We make a short climb from Ringmo Khola that takes us to the 3071m Trakshindo pass, then the trail drops down pass the monastery of the same name, on to Nunthala at 2320m. Overnight at Guest House. Day 08: Trek to village of Khare Khola 5 hours, overnight Guest house (B/L/D). Leaving Nunthala , the trail continues descending to the Dudh Koshi (Milk River) where the trail then ascends through several Sherpa villages, terraced fields and forests to Khari Khola. Overnight at Guest House. We start early after the breakfast crossing server settlement to reach in Surkhe at 5 hours trekking, overnight Guest house. We start a day with a climb towards Puiyan through Sherpa villages and a forest inhabited by monkeys, passing through a narrow canyon before arriving at Puiyan. We continue a climb from Puiyan to a ridge at 2800 meters, before a gradual ascent to the final ridge, where we descend to Surke following the trail towards Phakding. Overnight at Guest House. Day 11: Trek to Namche Bazaar 3440m 5.30 hours, overnight Guest house (B/L/D). Day 12: Rest day in Namche Bazaar, overnight Guest house (B/L/D). Today is rest day, however, we should do some activities such as to climb Syangboche airport, visit Sherpa home in khumjung/Khunde or view from Everest view point Hotel 2hr. 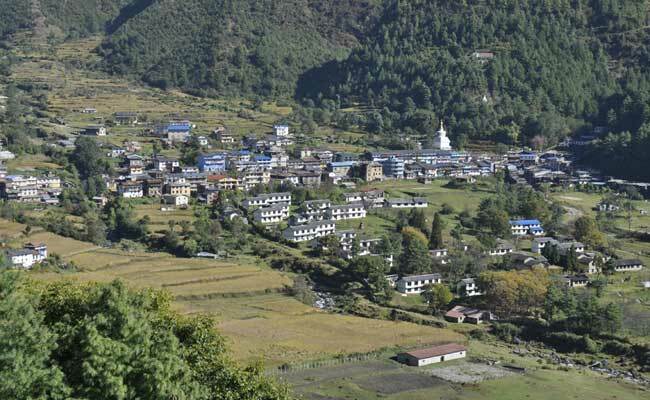 Namche bazaar has many officials or offices, including army base camp and bank. Namche used to be trading center, where grain from the south was exchanged for salt from Tibet and it’s remains now a trading center. Every Saturday is market day. 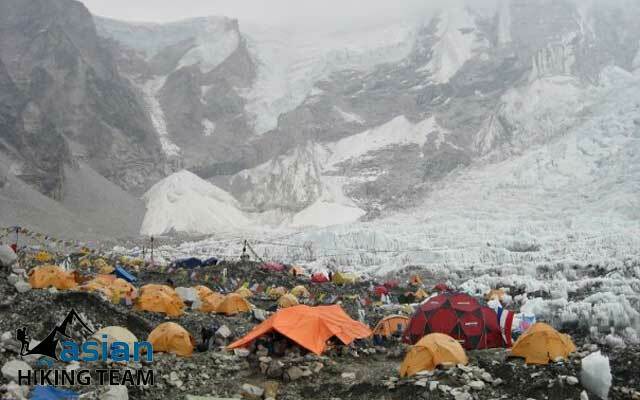 There is headquarter of Sagarmatha National park & Sagarmatha pollution controlled Project. Here is Sherpa Museum & monasteries. Day 13: Trek to Tyangboche 3767m 5 hours, overnight Guest house (B/L/D). The tail rise to the settle to the east of Sagarmatha nation park Museum (3520m), Instead, contour high above the Dudh Kosi pass Kyangsuma, down to reach Phorse Tanga and climb 2 hours to reach Tengboche (3767m, overnight Guest house. Day 14: Trek to Dingboche (4410m) 5 hours, overnight Guest house (B/L/D). Today, we start early around 7 to 8 o’clock. Half an hour down to Debuche, where is monastery and small settlements inside the alpine forest. After 45 minutes walk to cross the bridge, continues climb to reach lower Pangboche. We are not plan to visit pongboche village because of we directly plan to go Dingboche. If you are so interest we can short visit as well, you can talk with your guide. Have a lunch in Somare and gradually walk up. There is two way, one heading to Pheriche and other is Dingboche. Right hand side direction is our way to Dingboche takes us 1.30 hour to our hotel. After our arrival, have a short drinks with rest and climb 200 meters over the Nagarjun hill because of everyday we “ascent high and sleep in low”. Overnight guest house. Day 15: Rest day in Dingboche, overnight Guest house (B/L/D). Today is rest day, we can visit the Monastery over the hill top its takes 2/3 hours to see the view of Mt. Makalu which is above 8000m High Mountain or we can explore opposite of Dingboche, cross the Imja Khola and steeply climb near the Amadablam Mountain, overnight Guest house. Day 16: Trek to Lobuche 4910m meters 5 hours, overnight Guest house (B/L/D). Trek to Dhukla may we have lunch and climb to Dhukla pass where many memorials monuments who died in Everest summit. It takes 5 hours to Lobuche Overnight lodge. Day 17: Trek to Everest Base Camp (5365 meters) then trek back to Gorak Shep (5180 meters) 7 hours, overnight Guest house (B/L/D). Early in the morning leaving Lobuche, after lunch in Ghorap-shep within 3 hours we will head up to Everest Base camp (5365 meters), and return to Ghorak-shep at elevation of 5180 meters at noon for our overnight stay. We walk over the moving stone with jump so it does hard be careful to walk. Overnight at Guesthouse with breakfast, lunch and dinner with hot drinks. Day 18: Trek to Kalapattar (5545 meters) then trek down to Pangboche (3960 meters) 6 hours, overnight Guest house (B/L/D). After reaching Base camp of Everest our aim today is to trek Kalapattar (5545 meters). We start early morning before sunrise to reach the viewpoint that offers some of the best views of Mount Everest as well as other panoramas of the surrounding mountains. Kalapattar means “Black rock”, most excellent view point in the world. After late breakfast descend to Pongboche at elevation of 3960 meters 6 hours. Overnight at Guesthouse. Day 19: Trek to Namche bazaar, overnight Guest house (B/L/D). Today, we start late because of hard trekking day yesterday and it is short day to Tengboche. First 3 hours bring you down passing Pangboche, Deboche, Tyangboce and crossing bridge to reach Kangjuma and 1.30 hour trekking to Namche Bazaar 3440 meters 5.30 hours, Overnight hotel. Day 20: Trek to Lukla 2840 meter 6 hours, overnight Guest house (B/L/D). After breakfast we steeply down to cross the bridge climb to Monju where national park checks office. Finally we return to Lukla Enjoying last nigh in Himalaya, Overnight guest house/hotel. Day 21: Fly to Kathmandu transfer to hotel (BB). Early morning flight back to Kathmandu and free day or shopping/sightseeing. Day 22: Departure or next trip (B). Last minute, transfer to airport for your onward journey or next trip.